A bow shock forms around the Constellation Program's 327-foot-tall Ares I-X test rocket traveling at supersonic speed during its Oct. 28, 2009 launch from the Kennedy Space Center, Fla. The rocket produces 2.96 million pounds of thrust at liftoff and goes supersonic in 39 seconds. NASA?sgleaming new Ares I-X rocket grew an odd-looking hood Wednesday as it launchedskyward on a suborbital test flight ? a telltale sign of a rocket goingsupersonic. The hood wasactually a vapor cone, sort of like a man-made cloud, created as the long,slender Ares I-X rocket hit Mach 1 and broke the sound barrier. Photographer ScottAndrews caught the moment 39 seconds after the 327-foot (100-meter) rocket blastedoff from NASA?s Kennedy Space Center in Florida. It can also be seen in NASA?s videoof the Ares I-X launch. The phenomenonis not well studied, but has been seen on jet aircraft and spacecraft,like NASA?s space shuttles and the massive Saturn V rocket, as they surpass thesound barrier. The vapor cone is also referred to as a shock egg or shockcollar. Scientists thinkthe phenomenon is caused by something called the Prandtl-Glauert singularityand starts when a layer of water droplets is trapped between two high-pressuresurfaces of air. 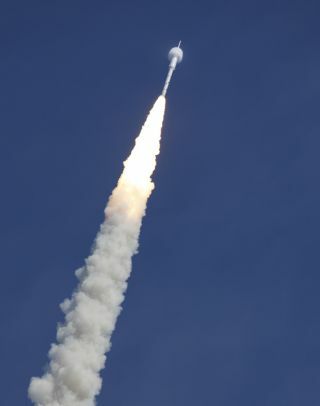 In humid conditions, condensation can gather in the troughbetween the two crests of sound waves produced by a launching rocket or flyingjet. It does not always coincide with breaking the sound barrier. Photographerscaught a vapor cone on the 363-foot (110-meter) Saturn V rocket that launchedthe Apollo 11, NASA's first manned moon landing mission in 1969. NASAcameras also capture the phenomenon every now and then during spaceshuttle launches, such as the STS-106 flight of Atlantis in 2000. NASA?s AresI-X rocket is a trial version of the new Ares I booster slated to launch thecrew-carrying Orion capsules that the agency plans to use once the shuttle fleetretires. The prototype consisted of a four-segment solid rocket booster(recycled from the space shuttle fleet?s inventory) capped with a dummy fifthsegment and mock-ups of a second stage, Orion capsule and abort system. NASA expectedthe rocket to hit a maximum speed of Mach 4.7 before its firststage separated from a dummy upper section two minutes after launch. The firststage carried parachutes to slow its return and splashed down in the AtlanticOcean to be recovered by a retrieval ship. The dummy second stage, however, wasdiscarded after separation. It crashed in the ocean furtherdownrange as planned. The launchtest demonstrated the feasibility of the Ares I rocket design, mission managerssaid. NASA?s plan of using Ares I and Orion craft to replace the shuttle fleetand returnastronauts to the moon by 2020 is currently under review by the WhiteHouse. Clickhere for SPACE.com's full Ares I-X mission coverage.